Today some unknown persons sprayed tear gas and shot up at the windows at the editorial board of the newspaper “Novyy Den” in Kherson. At that moment, there was held a press conference of Odessa entrepreneurs, as to IMI representative in Kherson region. An eye-witness, the journalist for edition “PIK” Oleksander Kornyakov” told IMI representative, among assailants they recognized Kyrylo Stremohusov, head of regional Socialist party, who represents himself as a journalist. “In a certain moment, two unknown persons get in by force into the location and sprayed tear gas. The participants of the press conference tried to close the door, but Kyrylo Stremohusov got in to the location and started dispersed the tear gas him too. He was forced out and I could start filming it”, Kornyakov told IMI. 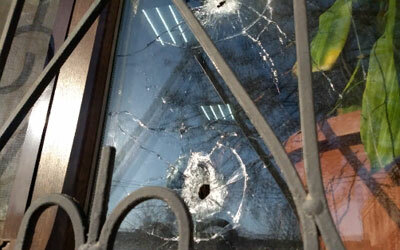 He added one assailant fired several shots at the window above the door. Another eye-witness, journalist Olena Nechypurenko, said she got eyes-burn. The assailants were detained and sent to police station. The investigation is underway. The editor in chief Anatoliy Zhupina was absent at the moment, he was on a mission in in the region. “They chose the moment I was not on the spot to get up all that”, he said.